The search found 37 results in 0.096 seconds. 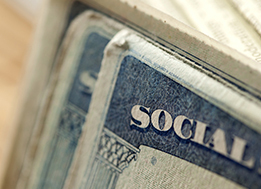 On average, Social Security benefits exceed Social Security taxes over an individual’s lifetime. What Effect Does Social Security Have on Poverty? Recent research has found that Social Security is more effective at reducing poverty than previously believed. Without income from Social Security, two thirds of the elderly would be considered poor. The number one financial worry for Americans is having enough money for retirement — and for good reason. Federal entitlement programs will more than double between 1983 and 2048. Social Security is the largest single program in the federal budget and makes up approximately one quarter of total federal spending. The report projects that in 2018 — for the first time since 1982 — the program’s total costs will exceed its total income. Most OASDI income comes from payroll taxes. Retired and disabled workers make up 82 percent of OASDI beneficiaries. Social Security provides social insurance by redistributing income from high earners to low earners.